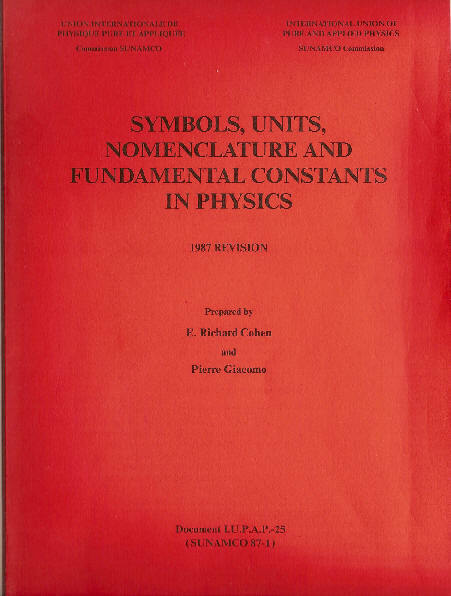 The recommendations in this ‘Red Book’, compiled by the Commission for Symbols, Units, Nomenclature, Atomic Masses and Fundamental Constants (SUN/AMCO Commission) of the International Union of Pure and Applied Physics (IUPAP), have been approved by the successive General Assemblies of the IUPAP held from 1948 to 1984. This document replaces the previous recommendations of the SUN Commission published under the title Symbols, Units and Nomenclature in Physics in 1961 (UIP-9, [SUN 61-44]), 1965 (UIP-11, [SUN 65-3]) and 1978 (UIP-20, [SUN 78-5], Physica 93A (1978) 1-63). (1981-1987): K. Birkeland (Norway), W. R. Blevin (Australia), E. R. Cohen (USA), V. L Goldansky (USSR, Chairman, 1981-1984), E. Ingelstam (Sweden), H. H. Jensen (Denmark), M. Morimura (Japan), B. W. Petley (UK), E. Roeckl (Fed. Rep. Germany), A. Sacconi (Italy), A. H. Wapstra (The Netherlands), N. Zeldes (Israel). There are two broad classes of dictionaries: those that are prescriptive and attempt to establish the norms of a language and those that are descriptive and report the language as it is used. For dictionaries of a living language, both types have their place. A manual of usage in science however must be primarily descriptive and should reflect the standards of practice that are current in the field and should attempt to impose a standard only in those cases where no accepted standards exist. This revision of the handbook has taken these precepts into account while expanding the discussion of some topics and correcting typographical errors of the 1978 edition. There has been some reordering of the material with the hope that the new arrangement will improve the logical flow, but, since physics is not one-dimensional, that goal may be unachievable. The recommended symbols in section 4, particularly those related to physical chemistry, have been actively coordinated with the corresponding recommendations of Commission 1.1 on Symbols, Units and Terminology of IUPAC in order to avoid any conflict between the two. The values of the physical constants given in section 6 are drawn from the 1986 adjustment by the CODATA Task Group on Fundamental Constants.